Denon DP-450USB Hi-Fi turntable with USB port to digitize your vinyl collection with MP3 or WAV file quality. Reinvigorate your passion for vinyl at home or on-the-go with the Denon DP-450USB. Integrated USB-A port lets you digitize your vinyl collection and create quality records in MP3 or WAV file formats. Strong, sophisticated design perfectly blends with the existing Denon Design Series. 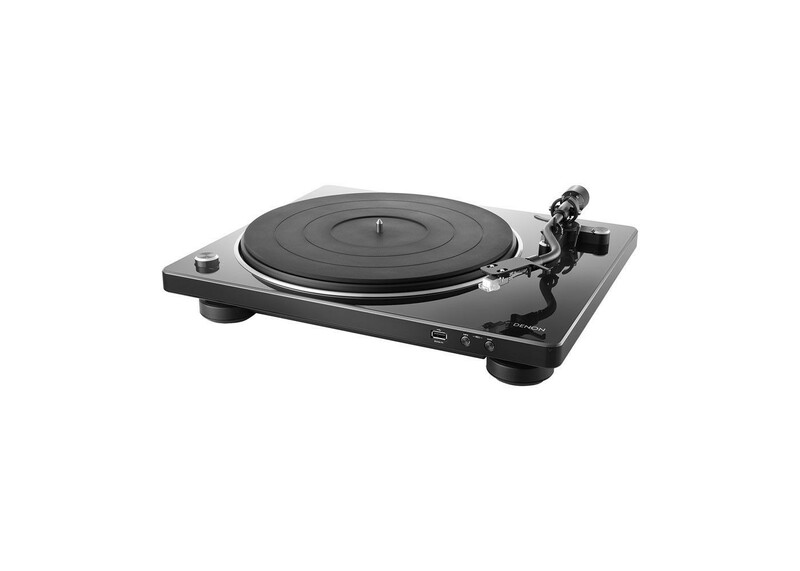 Curved, horizontal tracking angled tone-arm and weighted, belt-driven platter spins your 33 1/3 rpm, 45 rpm or 75 rpm records with precision and detail. Connect the DP-450USB to any amplifier or system with analog inputs via the built-in phono equalizer and enjoy music that’s faithful to the original recording. Enjoy your vinyl collection anywhere with DP-450USB. Integrated USB-A output allows for one-touch recording of your favorite vinyl records onto a USB drive as MP3 or WAV format files. Play your albums on the DP-450USB or record and take them with you to enjoy trusted Denon sound wherever you go. Features a carefully engineered curved, horizontal tracking angled tonearm with auto-lift and playback stop. When the vinyl reaches the end of playback, the tonearm auto-lifts 10 seconds prior to the groove end and returns to its seated position, preserving the excellent condition of your album. Curved tonearm design also reduces harmonic distortion, ensuring a crystal clear sonic signal every time you listen. Strong build construction offers both the strength and high-density needed to reproduce detailed, resonance-free music. Thick cabinet walls and a weighted platter provide the optimal surface for your vinyl collection, reducing external vibration. Pair DP-450USB with the rest of the Denon Design Series for a durable, high-resolution system. Supports playback at 33 1/3 rpm, 45 rpm and 78 rpm. Easily play your entire vinyl collection and enjoy its full breadth. Takes minutes to unbox and quickly operate for novice and seasoned vinyl fans. Plug DP-450USB into your favorite amplifier or system, including the Denon Design Series, and immediately begin reconnecting with your vinyl collection — it’s that easy. Removable dust cover features a modern design, elevating the overall aesthetic of DP-450USB while eliminating vibration issues that affect music quality associated with attached covers. Doubling as a display stand for your album cover, place the dust cover upright on the included base and show it proudly to friends and family. Built-in phono equalizer creates an open, enveloping sound stage that enlivens your cherished vinyl collection while staying true to the original recording as the artist intended. Connect it directly to a mini component or integrated amp that lacks a phono terminal for seamless use. Includes an MM cartridge for more precise listening and added musical detail. As a producer of the longest-selling cartridge in market, enjoy the Denon DP-450USB turntable with confidence. If you prefer listening via an MC cartridge, easily swap out the existing MM cartridge to fit your audio preferences. Enjoy iconic Denon sound quality however you choose to listen. Cut and organize your ripped vinyl albums with this easy-to-use PC software (for MP3 format only). Download the metadata for each track and easily build a digital library of your vinyl collection with each record’s original warmth and sound. Integrated auto sensor accurately controls the platter, preventing unwanted speed fluctuations during playback — enjoy audio reproduction exactly as the artist intended. At just 415 mm in width, DP-400USB is constructed to fit seamlessly into your existing Hi-Fi system. Though compact in size, it still delivers the powerful, detailed sound you expect from Denon. Blending seamlessly with the popular Denon Design Series, DP-450USB features a sophisticated form factor and solid construction. Durable aluminum materials offer a modern aesthetic. Pair it with the rest of the Denon Design Series to complete your elegantly designed Hi-Fi system.